I woke up to a beautiful weather outside. Even though I wanted to stay in bed and sleep in, I knew I had a busy day ahead of me so I wanted to get out and do some light activities. I have trouble motivating myself to go out of the house for a workout on some days, but I always know that once I do, I’ll feel so much better. I came home and made my sweet and salty breakfast. I was in the mood for something salty, so I added cottage cheese once the oatmeal was cooked. Added bonus is the extra protein. Love the Pear Fig Jam that I bought during my Napa trip in November. 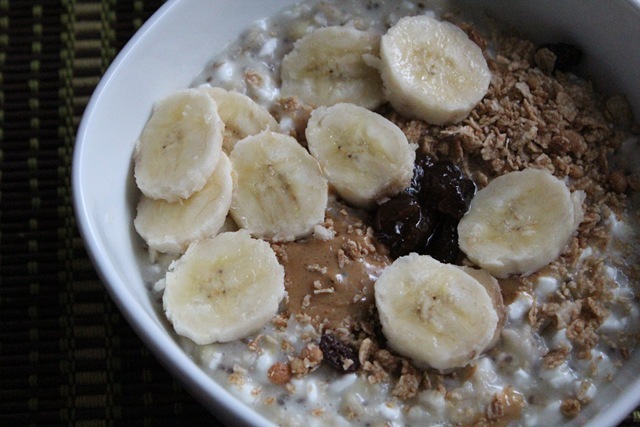 Perfect bowl, just the right combination. After breakfast, I made a shopping trip to Target. I bought a bridal shower gift for my friend and coworker Alicia, who is getting married in 2 weeks. We used to watch Food Network during our lunch time and we always catch Giada’s show. I hope that this gift will remind her of our fun lunch dates whenever she uses it. 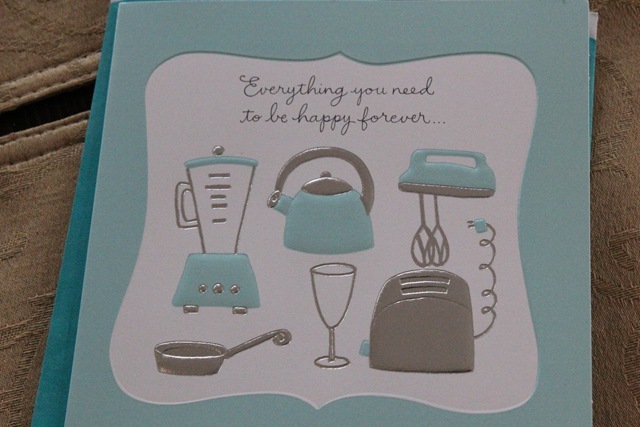 “Everything you need to be happy forever….you’ve found in each other. 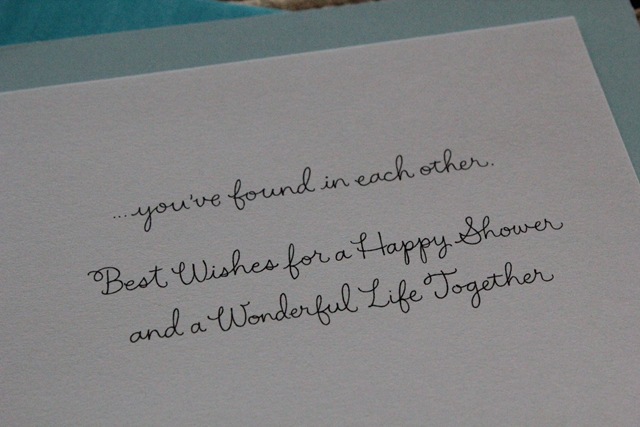 Best Wishes for a Happy Shower and a Wonderful Life Together”. Then it was time for lunch. Just a simple plate of vegetables and brown rice. 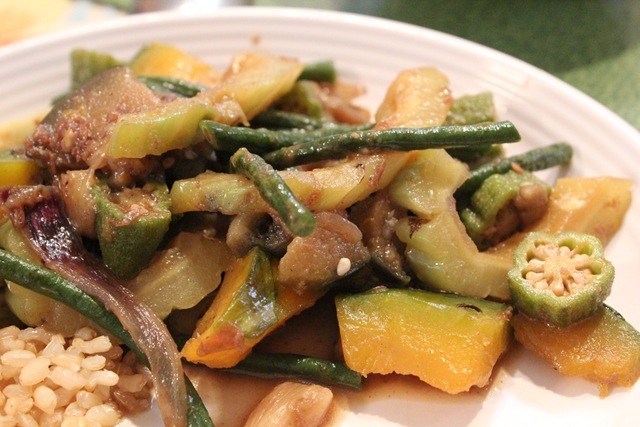 Vegetables included okra, bitter melon and perfectly cooked kabocha squash. It was warm enough to wear some early spring clothes so my sun dress was just right for the party. 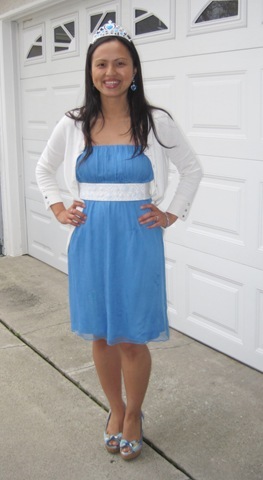 And I wanted to wear blue because it’s the bride-to-be’s favorite color. The glowing bride-to-be. So happy she liked my gift 🙂 Our group also won our destination wedding inspired toilet paper wedding dress. For dinner, we are having fish taco night. The fiance is cooking one of his favorite dishes. He catches the fish himself so it’s really fresh and his secret ingredient is the white sauce. 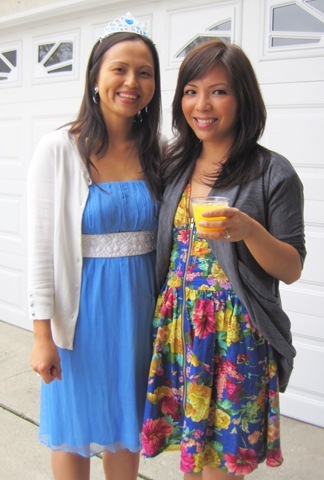 Simple veggies and rice is such a perfect go-to meal =) Ohmygosh and I LOVE your dress! I love the shoes! 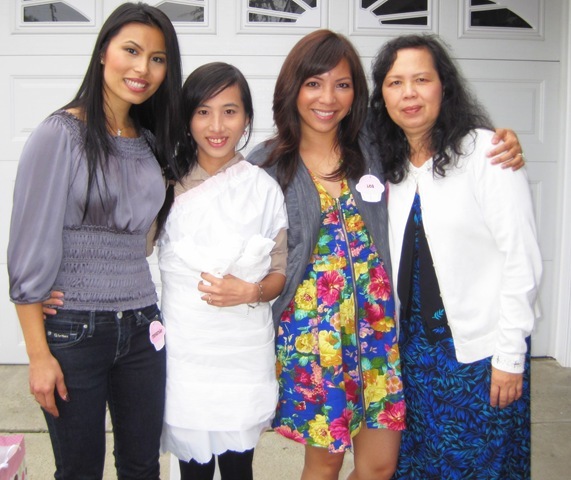 You looked adorable at the wedding! And I’m with ya on getting up and working out. I drug myself to run around 3 miles today and afterwards, I wondered why it was so hard to get me there in the first place. your breakfast looks delish! and your dress is super cute, too! You’re so lucky that its warm! We have a snow warning! Look like you a a great day today. 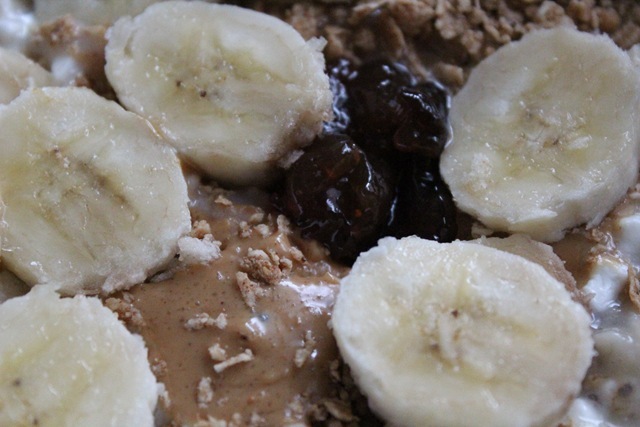 That oatmeal looks yummy and full of nutrition. 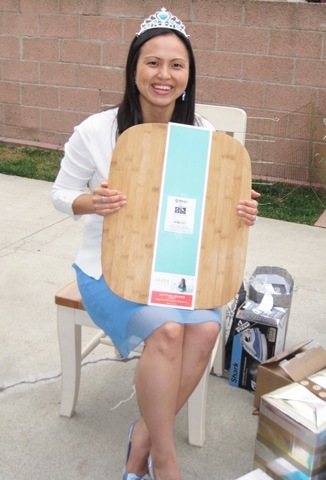 I love Giada I have that same cutting board as well and it’s great. ahh pear fig jam sounds amazing!!! love your dress too! Looks like a really nice day, and a thoughtful gift! 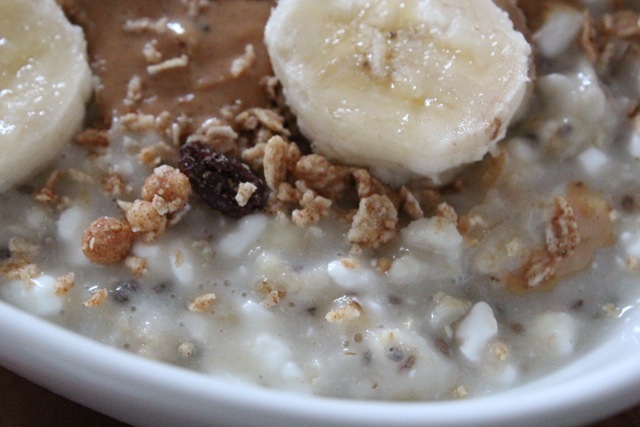 mmm, that oatmeal looks awesome! glad you had a great day, it was nice and warm and sunny here in arizona yesterday too! pretty dress! i love cottage cheese in my oatmeal too. 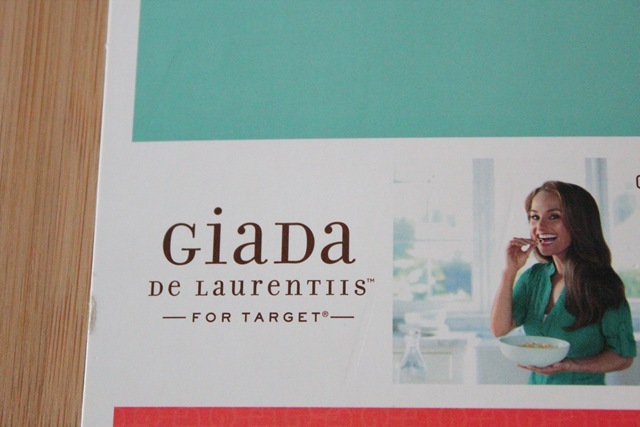 just bought a jar of giada’s pasta sauce @ target….can’t wait to try it! Cute dress- love the floral print. 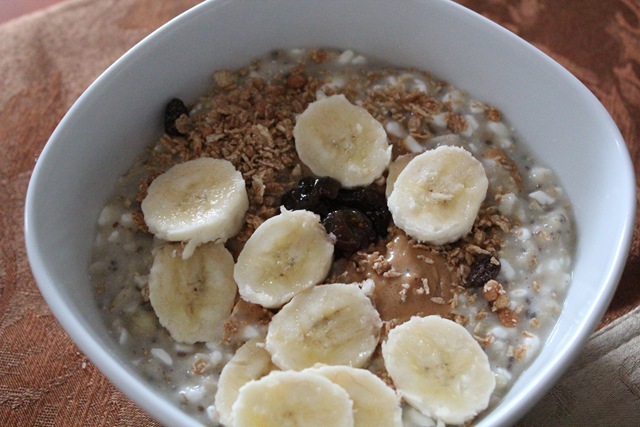 Your bowl of oats looks delicious! And I love how colorful that Arden B dress is.